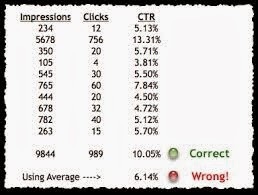 Before you make Ads Banner For Advertising you need to identify what are the best CTR - Average Click Through Rate. What are the best Click Through Rate - The purpose of click-through rates is to capture customers' initial response to websites. Average CTR (or average click-through rate) is the ratio of ad clicks to impressions in your AdWords campaigns. While basic CTR measures the rate of clicks on each ad, average CTR calculates the amount of clicks vs. impressions across your campaign, or for each individual keyword. A low ad CTR is problematic, as it can drag down your Quality Scores and affect future ad placement. Low CTRs signal a lack of relevance for your ad viewers, who aren’t inspired to click on your ad and visit your landing page to learn more about your offer or take the desired action. On the other hand, a high average CTR – either across your campaign or for a specific keyword – doesn’t always mean success. It is one indicator that, when combined with other KPIs (key performance indicators) can point to the success of your campaign. However, high average CTRs with low conversions may actually mean that you’re wasting spend by attracting people less likely to convert. This may be caused by targeting that is too broad, irrelevant ad copy, or a combination of both. Average CTRs can also affect future ad performance, as Google uses your historical data to calculate their Expected CTR, how likely they think it is your ads will get clicks when shown for specific keywords. Better keyword targeting and negative keyword discovery can help you improve your CTRs, thereby reducing wasted spend and improving your Quality Scores.